The Bido Traditional O Rigger is a product that should be in every rigger's or rope enthusiast's toy bag. The broad curve of this classic O rigger holds multiple lines with ease while maintaining a more traditional look. The Bido Traditional O Rigger is a product that should be in every rigger's or rope enthusiast's toy bag. The broad curve of this classic O rigger holds multiple lines with ease while maintaining a more traditional look, allowing you lots of rigging options. The O is made of a single billet of aircraft aluminum with an anodized black finish. It is super lightweight, but made for extra heavy weight loads. 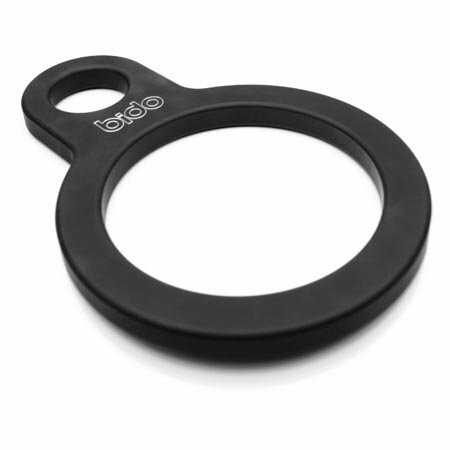 The O may be tied to directly or easily accepts carabineers. Made in the USA of 6061 Aluminum, with no welds.